Ten professional fashion designers from The Gambia who attended Nigeria fashion show returned back home with full of inspiration and determination to rebuild and move Gambia fashion industry to the next level after being accepted by large audience for their collections. The theme of the show is Going Green2 meaning that those rubbish that have been through all over the environment can be recycled to something useful. 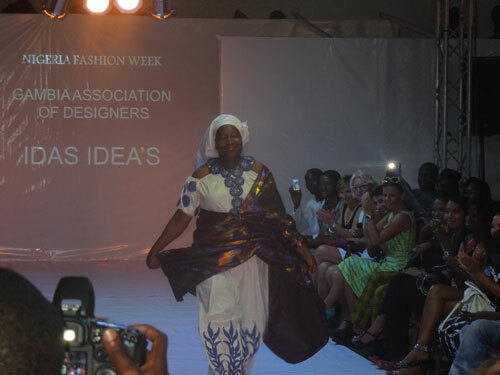 Ida Saine Conteh, Vice President of the Gambia Fashion Designers who spoke on behalf of the team, said the trip was successful, this is the first time Gambians are attending international fashion show of this nature. Madam Saine Conteh added that everybody was surprised to see that The Gambia can produce something like this. She noted that the main purpose of the whole show is to discourage people throwing rubbish all over the environment. We have been going to trade fairs but this one is the best in Africa. I was surprise because I was thinking that The Gambia cannot produce this kind of designing but instead we did wonders. Madam Saine Conteh further said they also display some of the Gambian culture at the show, adding that so many dresses were made out of the materials they went with. She said next year The Gambia will also do a similar fashion show where by we will also invite those people to come and attend it because it has never happened in The Gambia. “We have learnt a lot from this show”, she said, adding that they have seen things that they never thought which was a study tour for them. We have met with very important people who know more about fashion show and we are going to do the same strategies to do something like that in this country. We want to show Gambians what we have made during the show. It was a very big achievement for us for over fifty designers all to showcase what they have. This is the biggest runway I have ever attended, Madam Saine Conteh explained. The Vice President Fashion Designers Association therefore thanked the Government of The Gambia for it support as well as all those Gambians who have contributed one way or the other for them to attend this important show.